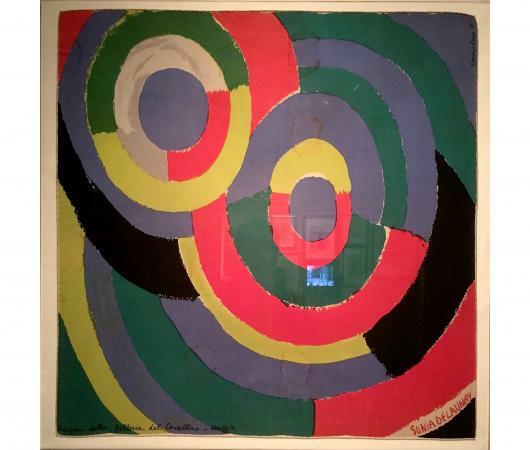 The artist Sonia Delaunay sought ways to bring modern art out of the confines of traditional easel painting. She carried this out by refashioning everyday objects as tools to explore her theories of color and by infiltrating daily life with art in a way that traditional painting could not. While her involvement in the fashion business spanned less than a decade, her prolific career in textile designs and color studies continues to influence fashion designers. Sonia Terk was born 14 November 1885 into a poor Jewish family in the Ukrainian village of Gradizhsk and adopted by her well-to-do aunt and uncle in Saint Petersburg at an early age. She studied art periodically in Karlsruhe, Germany, and continued her studies at the Académie de la Palette in Paris, where the intense color palette of artists of the fauvist movement influenced her early development as a painter. In 1910 she married the painter Robert Delaunay, whose research into the theory of "simultaneity," or "Orphism," served as the basis for her lifelong experiments in color. This new style, which attempted an instantaneous visualization of the experience of modern life in all its complexity, conveyed rhythmic energy and dynamic movement through the creation of color contrasts on the painted surface. Sonia Delaunay's first "simultaneous" paintings include Contrastes simultanés (1912) and Le Bal Bullier (1913), and she created her first simultaneous dresses in 1913 to match the energy of the new foxtrot and tango at the popular Parisian dance hall Le Bal Bullier. She also collaborated with the poet Blaise Cendrars to design a simultaneous book, La Prose du Transsibérien et de la Petite Jehanne de France (1913). In the initial years of her marriage, she integrated the realms of home and art by fashioning her apartment in the simultaneous style, creating blankets, cushion covers, lampshades, goblets, and curtains. The Russian Revolution of 1917 resulted in the cutting off of Delaunay's substantial family income, so she turned to her marketable designs as a new means of financial support. Living briefly in Spain, she quickly established her public reputation as an innovator in both costume and fashion there by designing costumes for Sergey Diaghilev's Cléopâtre (staged in 1918) and showcasing simultaneous dresses, coats, home furnishings, and accessories in her store, Casa Sonia. This exposure earned her interior-decorating commissions from wealthy patrons and the Petit Casino theater (opened 1919). In 1921 Delaunay returned to Paris and developed a new genre, robes-poèmes (poem-dresses), by juxtaposing geometric blocks of color and lines of poetry by Tristan Tzara, Philippe Soupault, and Jacques Delteil onto draped garments. She received a commission for fifty fabric designs by a Lyons silk textiles manufacturer, and over the next thirty years, the Dutch department store Metz and Company purchased nearly two hundred of Delaunay's designs for fashion and home decoration. In 1923 she designed costumes for Tristan Tzara's theater production La coeur à gaz (The gas-operated heart) and her first exhibition-style presentation of her textiles and clothing took place at the Grand Bal Travesti-Transmental. The following year, Delaunay established her own printing workshop, Atelier Simultané, so that she would be able to supervise the design process of her prints. Embroideries in wool and silk combinations, sometimes accented with dull metal and mixed furs, incorporated a new stitch she invented, point du jour, or point populaire. Delaunay's meticulously embroidered and appliquéd coats brought commissions from the wives of fashion designers, artists, and architects, and from film and theater actresses including Gloria Swanson, who brought the Atelier much publicity. Delaunay approached her textile designs in the same manner as her paintings. She incorporated rigorous yet simple geometric shapes, stripes, spirals, zigzags, and disks, crossing and intermingling with the strict discipline typical of constructivism. Colors were limited to four, occasionally five or six, contrasting hues in the same design: deep blues, cherry reds, black, white, yellow, or green, or softer combinations of browns, beiges, greens, and pale yellows. The vibrant synergy of these colors exemplified Delaunay's concept of modernity and the rhythms of an electrified modern city. At the 1925 Exposition des Arts Décoratifs, Delaunay collaborated with the furrier Jacques Heim in displaying female fashion, accessories, and interior furnishing in her Boutique Simultané. That same year, the Librairie des Arts Décoratifs responded to the positive reception of her work by publishing an album of her fashion plates titled Sonia Delaunay, ses peintures, ses objets, ses tissus simultanés, ses modes. Delaunay's success with fashion lay partly in the adoption of the liberating, contemporary silhouette for female clothing that developed during World War I. The stylish, unadorned tunic cuts of the mid-1920s, with straight necklines, no waistlines, and few structural details, served as a blank, two-dimensional canvas for her geometric forms. Shawls, scarves, and flowing wraps for evening gave her additional flat surfaces on which to explore, enabling her to expand her business. She also challenged traditional practices in the fashion industry. In a lecture at the Sorbonne, "The Influence of Painting on Fashion Design," she explained the tissu patron (fabric pattern), an inexpensive invention that allowed both the cutting outline for the dress and its corresponding textile design to be printed at the same time. Financial pressures during the Great Depression, coupled with the 1930s trend toward fabric manipulation and construction details that did not accommodate her designs, led Delaunay to close her couture house in 1931. She foresaw that the future of fashion was in ready-to-wear, not the custom pieces she was creating. While she turned away from fashion design after this point, she continued to take private orders from the couturiers Chanel, Lanvin, and especially Jacques Heim. Delaunay spent the rest of her life concentrating on painting and continued to apply her theories to a wide range of objects, including tapestries, bookbindings, playing cards, and a children's alphabet. She also became involved in projects with the poet Jacques Damase. Toward the end of her life, she exhibited frequently and was honored in 1967 with a major retrospective exhibition at the Musée National d'Art Moderne in Paris for her contribution to modern art. She died on 5 December 1979 at the age of ninety-four. Textile and fashion design gave Delaunay the freedom of experimentation and spontaneity that she later transposed into her paintings. She brought art to the streets and made her wearable paintings an integral part of the everyday. Her artistry has had a profound influence on the work of contemporary fashion designers including Marc Bohan for Christian Dior, Perry Ellis, Yves Saint Laurent, and Jean Charles de Castelbajac, all of whom have referenced her work in their collections. See also Art and Fashion; Gabrielle (coco) Chanel; Christian Dior; Fashion Designer; Perry Ellis; Jeanne Lanvin; Yves Saint Laurent. Damase, Jacques. Sonia Delaunay, Fashion and Fabrics. Translated by Shaun Whiteside and Stanley Baron. London and New York: Thames and Hudson, 1991. An extensive collection of the artist's fashion illustrations and textile designs of the 1920s. Sonia Delaunay. Nous irons jusqu'au soleil. Paris: Editions Robert Laffont, 1978. An autobiography based on journal entries starting from the early 1930s.